HOT DAMN, I loved this movie! heheheheh It's just a ton of fun. Deputy Hancock is due to pack it in for the night on Halloween, but one more call sends her to a mansion where someone....or something...very evil is. When she brings it back to the station, everyone there seems to see some "BIG BAD" from their past in Hancock's prisoner and they want to blow it away. They finally get a hold on the situation, but what are their small forces able to do against....Evil? Deputy Hancock and Sheriff Pete need to figure something out before time runs out on the world. Like I said, this film is a ton of fun and a great watch. It's set to be released on AMAZON October 31st and I think it'd be a great Halloween Eve watch. Wish they released it sooner, really, but....what'r'ya gonna do? The film has great dialog, fab music, and a peppy pace. A majority if it is presented in black and white with these fun, full color vision scenes mixed in that I loved. They also have a few comedy elements that play rather well for the most part. It's a tricky one - they play around with various horror elements and the humor has a placement that is more natural than forced. Hard to do that successfully with smaller films. I believe that one of the main reasons the film works so well is the actors attached to it. 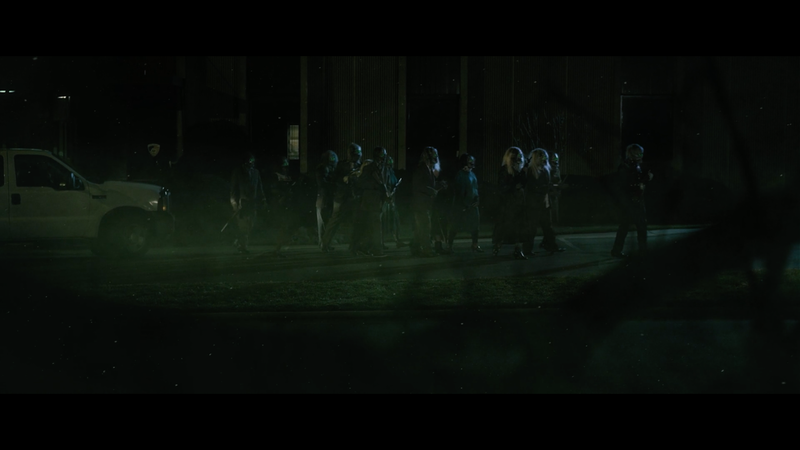 They are all super capable and help to get the viewer invested in the film. Bad acting or a bad script can kill a film in minutes. (As I found out with another film earlier today....whew.) Everyone in LIVE EVIL carried their own and really came off as believable. Charlene Amoia's portrayal of Hancock could have sunk the whole venture if she came off as cardboard, but she was far from that. She was spunky, sure of herself, and tough without coming off as "I'm putting on my MAN costume and being tough." Prague born Vladimir Kulich was fab as the Sheriff as well - again, for from a caricature. LIVE EVIL had an Italian horror feel to me - like a take on Fulci's THE BEYOND. It had a great look and feel to it that seemed well thought out and which worked within the budget they had without over extending itself. For instance, there are masks used in the film which can be a bit distracting and..."meh". But, here they dolled things up and made the masks the overall stylistic look for the dead in the film, spicing things up with some visual effects work that was well executed. As a matter of fact, the visual effects bits were friggin spot on. Glowing eyes, muzzle flashes, strange dreamy sequences, and general "spice" peppered in perfectly. And, just when you think you've seen all the visual nuggets they have to offer, they switch things up and add some other cool scene that does another series of cool effects visuals. There was a nice little Day of the DEAD reference in here as well that I smiled a big, wide smile at. Very cute. 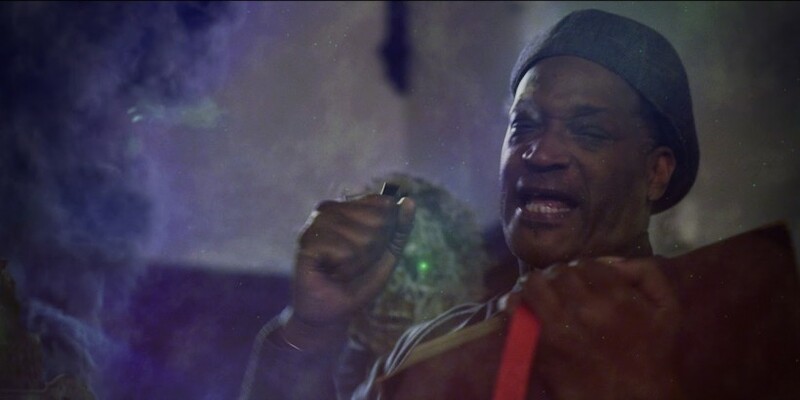 And...TONY TODD! Yeah, you can never have enough of Mr. Todd. I'll be owning this film in the near future. I want to support this effort from Ari Kirschenbaum and Team. Kirschenbaum's writing and directing was a ton of fun and I want to see more. Now...odd thing about this film. I think it might have been held in some sort of HORROR GULAG - IMDB has it listed as a 2015 film. However, we all know this can happen for sure. (TRICK 'R TREAT) I really should set up and interview - I'm just at a loss as to what I'd actually ask. I don't want to get on a call and just gush about how much I love someone's movie. While I'm sure they wouldn't mind hearing it, it's probably not the best use of their time. Heh. I've seen a bunch of screeners over the past few months and this has to be one of my A LIST picks for sure. I highly recommend that you grab a few friends and give this a viddy this Halloween!